In clinical trials, the items and item groups used to capture and display clinical trial data. the place in which hares lie and may give birth to young. n the configuration, shape, or particular appearance of anything. n a registration sheet for new patients on which data (e.g., the patient's name and address) are recorded and that contains a statement of the policies of the specific dental professional's office or clinic and the responsibilities of the office or clinic to the patient. n the natural shape of a part. n one of three types of manually recorded dental documentation, features a graphic template displaying a representation of each tooth, as well as the roots and gingival tissues. Design provides for note taking associated with each tooth. The form becomes part of the patient's legal health records and is useful for planning patient care and ascertaining legal questions regarding treatment, and is relied upon for patient identification in the event of an emergency. See also form, examination. n the shape of the dental arch. See also arch, dental. n the modifications necessary, beyond basic outline form, to facilitate proper instrumentation for the preparation of the cavity or insertion of the restorative material; also the placing of starting points or slight undercuts to retain the first portions of restorative material while succeeding portions are placed. n the outline form of the face from an anterior frontal view. n the shape that permits optimal performance. n one of three types of manually recorded dental documentation, describes each tooth by either a number or a letter within a quadrant. 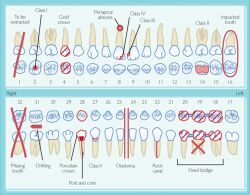 The gingival tissues and roots of the teeth are not included, making this chart unsuitable for periodontal assessment. n a checklist form, by means of which dental office staff can quickly make a record of telephone communications for the dental staff to look at later. n the form of the occlusal surface of a tooth, a row of teeth, or dentition. n the shape of the area of the tooth surface included within the cavosurface margins of a prepared cavity. n the distinguishing contours of the occlusal surface of the various posterior teeth. n a form used to gather personal (nonprofessional) data about a patient. n the shape given to a prepared cavity to enable the restoration and remaining tooth structure to withstand masticatory stress. n the provision made in a cavity preparation to prevent displacement of the restoration. n the shape of the root of the tooth. It is capable of being modified by such factors as resorption and cemental apposition. n the characteristics of the curves, lines, angles, and contours of various teeth that permit their identification and differentiation. Q. Is cholesteatoma a form of cancer? My ear Doctor diagnosed me with cholesteatoma. I am very scared. Does this mean I have cancer? Can I die from this? A. Cholesteatomas are not a form of cancer. They are benign tumors. They can destroy the bones of hearing as they grow, especially when the ear is infected or if water gets into the middle ear with other infections. Cholesteatomas are not life threatening but should be treated since they can cause complications if are not treated. If not treated, cholesteatomas will eventually erode the bone leading into the inner ear. This can cause nerve loss and deafness as well as severe imbalance and dizziness. The thin plate of bone that separates the roof of the ear from the brain can also be eroded by cholesteatomas. This exposes the covering of the brain. In extreme situations, it can lead to brain infection and other severe complications. Q. I am suffering form Bipolar Disorder. Hi, this is Mickey. I am suffering form Bipolar Disorder. What can I do to help myself to get better? A. Go see a professional - it's the best advice I can tell you. Bipolar disorder can be severe, and practically ruin one's life, and there's a good treatment, so my best advice is to seek professional help (doctor, e.g. a psychiatrist). Q. I wish to know whether consumption of probiotics in the form of medicine will have any side effects. I wish to know whether consumption of probiotics in the form of medicine will have any side effects. I wish to know the probable causes that could reduce them in gut? A. Taking probiotics in pill form might have some side effect especially if taken in excess may lead to some gut infections. You may also feel formation of gas in stomach. Taking on antibiotics or consumption of any toxic food can reduce the probiotics in the guts.